Pharmaceutical company Novartis (NVS) looks attractive right now from some financial angles. But is Novartis a great company to own going forward? Judging from its history of earnings and dividends, it seems to either lack good management or a defensible business moat. But I'm getting ahead of myself. First, let's look at why it might be cheap. For the last 12 years (the most data I have available), NVS increased its dividend an annualized 16%. That's an amazing track record! However, one should be skeptical of this record being achieved in the future -- especially because its earnings have only grown an annualized 7% during this period. Still, let's assume the current dividend can grow at a 6% clip going forward. If we require a 10% return on our investment, that means that a fair price for NVS is around $62. Given its market price is currently $52, that's a nice discount. If we instead insist on an 11% return, then the fair price drops to $49. So, the current price is no longer a bargain, but it's close. Assuming NVS is neither growing nor shrinking, we can assume it will continue to earn what it has earned on average in the last five years. Averaging the last 5 years earnings we get $3.62 per share. Now apply a P/E multiple of 15x, which is approximately NVS' historical average and the industry's average and also the current market average, then we get a fair price of $54. Not too far off its current price -- about a 4% discount. Now, to consider an investment, one must look at how long time shareholders have fared and whether the company has shown good results. Let's apply the Buffett test. I attribute this test to Buffett because I first heard this from him, but Ben Graham has written about it on his various books too. The test is very simple: has the stock price of the company shown $1 or more in return for every $1 retained (and not distributed to shareholders)? In NVS' case this is a big no. Let's look at the numbers, summarized by the table below. In the last five years, NVS has had about $66B in free cash flows (operating earnings minus capital expenditures). Over the same time, it paid out about $26B in dividends, thus retaining about $40B in earnings. However, what has happened to these $40 billion? They were mostly spent on acquisitions. Have the acquisitions been successful? Well, let's see: the stock price in the last five years should have grown by 40/2.42 (billion shares outstanding) = $17 per share. And yet, the stock market doesn't show that growth. In fact, the stock has gone nowhere in the last five years. From 2007 to 2011 the stock went from $59 to $57. Not only that, but NVS also blew most of the $4.6B it had on hand in the beginning of 2007. But perhaps the market is mispricing the stock now, you ask? Well, if you believe our analysis above, the current fair price is between $62 and $49. Nowhere close to the implied price of $76 ($59 -- stock price in 2007, five years ago -- plus the $17 it retained). So what's wrong? Perhaps management is not that capable. Perhaps the acquisitions haven't paid off yet but may in the future. Or maybe the company's business model is just not great. Maybe the industry is at fault? Well, maybe. It's a highly competitive industry and highly unpredictable, given the various status of pipelines, patent expiration and generics. Take JNJ for example, which is in the same industry. Its numbers aren't much better: JNJ's stock price hasn't gone anywhere in the last five years, but our calculation would suggest it should have grown by $11 during during these five years (for JNJ, at least, the balance sheet is in better shape and a lot of the retained earnings show up as cash). Why didn't NVS's number materialize, I can't say. But at a first glance, it signifies either poorly-timed (or poorly-priced) acquisitions or inefficient management, possibly combined with a tough environment for pharmaceutical companies. NVS looks cheap at these prices and could reward shareholders looking for a growing dividend income. But given its lackluster past in share price growth and poor track record of creating value for each dollar retained, shareholders should not expect significant price increases in the near future. Current shareholders should consider pressing management to increase the dividend, instead of using the cash on malinvestments. Disclaimers: I own NVS at the time of writing. 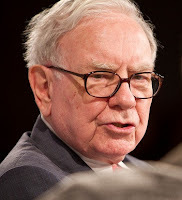 This past weekend Warren Buffett and Charlie Munger fielded some four dozen questions from shareholders, analysts and reporters on things as diverse as the shares buyback, how to become a successful investor and the notorious "Buffett rule". I expected that this year the main topic would be Buffett's heatlh, given that he recently announced he's got prostate cancer. But it was barely mentioned during the meeting, except for when Andrew Sorkin asked him how he was feeling. Buffett said he was great. Munger took issue with so much concern about Buffett and not much about him. Munger claimed he probably had prostate cancer too, but he wouldn't let anyone test him. That made the crowds laugh. In two separate questions, shareholders asked Buffett what he would do if he were starting today, what to buy and what to avoid. His advice for someone starting now would be to start early, build up a very good history of returns quickly and raise money to buy entire companies. He said he would have started earlier and sped up his early career to achieve what he has achieved later with Berkshire. The later part of his career he wouldn't change. He again referred to chapters 8 and 20 of the Intelligent Investor by Ben Graham as the two most important chapters one should read to be good investors. His ideal MBA course would teach students how to value companies and how to think about markets, which are exactly the topics of these chapters. As for what to avoid, he mentioned again one should steer clear from IPOs, since those tend to be done at the best time for the company and not the investor and they are typically hyped by media and analysts due to the fees associated with their sale. "Special promotions and commissions almost guarantee prices won't be cheapest", said Buffett. Buffett would also avoid buying medium or long-term sovereign bonds from any country, including the US, right now. As is already usual, a shareholder asked why a buyback instead of a dividend and Buffett again explained that a dividend is not as tax efficient for shareholders as a buyback. He's willing to buyback stock in unlimited amounts, so long the stock remains at or below 110% of price-to-book ratio, which significantly undervalues it, and that he keep at least $20 billion of working capital -- that's Berkshire's safety net. When asked about the buyback and why he implied the stock was undervalued but he never let shareholders know when the stock is overvalued, Buffett explained that it would make for a very awkward moment if he were to publicly announce when Berkshire stock was overvalued. Makes sense. 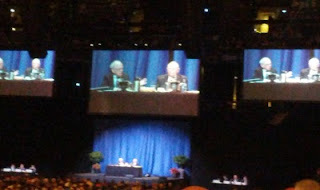 He also answered a question on why the BRK was undervalued now and whether it was due to the "Buffett rule" he proposed. He didn't speculate on why it was so, but just said these are things that happen in the stock market. Another shareholder asked him whether a dividend would help stabilize the stock price and reduce volatility by setting a floor for the stock and Buffett vaguely replied that in fact it wouldn't, that volatility happens for dividend payers too and that a dividend could also help increase volatility, but he didn't elaborate. I sent journalists a question about gold, but they didn't ask it. Luckily, a shareholder asked a related question pointing out that gold has outpaced the return of BRK stock in the last 10 years. Buffett, always with numbers on top of his head, replied that the price of gold and BRK 47 years ago where $15 a share and $20 per ounce, respectively and that now BRK/A trades for $120,000 while gold is at $1600. The problem, he explained, is that people look at short periods of when a security or asset had a strong return and try to extrapolate from it. (Granted, 10 years is not exactly a short period, but Buffett is a very long-term investor.) Both Munger and him emphasized again that productive assets are better than inert ones -- and they are more fulfilling and rewarding to hold, because one can see them grow and produce wealth, while inert things like gold remain the same forever. This is a very controversial point and I will just add that the distinction does not need to be black and white. Buffett is a businessman and likes to invest in companies. In the long run, an investment in well-managed companies at the right price should outpace the return of gold. But gold has its place in a well-diversified portfolio, especially because it's so hard to pick well-managed companies and buy them for the right price. So, sometimes a return of zero (after inflation), which is what gold offers, might be a good thing, when the economy is in trouble. When asked why he owned JP Morgan Chase for his personal account but Wells Fargo for Berkshire's account, Buffett explained that securities laws would see a purchase of the same stock in both accounts as a conflict of interest. He likes Wells Fargo more than Chase, but he is not allowed to buy Wells Fargo for his personal account, so he buys his second-best idea instead. He said he reserves his best ideas for Berkshire, always. A shareholder asked why he bought the Omaha World-Herald paper if he had said a while back that newspapers are a dying industry. The shareholder insinuated that Buffett might be self-indulgent by buying his home town's paper. Buffett then explained that he bought it because that particular newspaper has a very tight local community around it and local newspapers are still a reasonable business. No one buys a newspaper for looking up national news, stock quotes or classifieds anymore. But for local news, obituaries and other local information, they can be useful. Another good local paper is the one he already owns, in Buffalo, New York. Asked about technology, Buffett explained that both Apple and Google are incredibly profitable companies with large margins and they will probably do well 5 to 10 years from now. They are hard for competitors to dislodge. But he wouldn't buy either because he doesn't have any edge on studying them. He wouldn't short them either. Charlie said they have a reverse edge in analyzing deeply technological companies such as these giants. While not a fan of predicting the future, Buffett entertained a question about how to get a 4% return per year. He said that GDP tends to grow with the population (my note: plus changes in efficiency typically due to technology) and so anything more than a 1% real (i.e. after-inflation) return would be already a wonderful result for such a mature economy as the american one. Charlie agreed. At this rate, they added, the economy would double every 72 years or so and with inflation an indexing portfolio should double every generation. Buffett clarified that his proposed tax rule is meant to correct a deviation that has been increasing in the recent years. Currently, out of the top 400 highest individual earners in the country, a full 131 of them pay a tax rate below 15%. Years ago this number was only 16. This shift has been made possible by various loopholes and tax breaks given to the rich. He suggests a way to fix that so that he himself should be taxed at a higher rate than his secretary, Debbie. Munger was vocal about people thinking about "energy independence" the wrong way. He thinks we should use foreign oil first and conserve our own oil for later. Most people get this backwards and think of energy independence as extracting our own oil to avoid buying foreign oil. In summary, it was again a very useful trip. Every year I learn something new, though, the main tenets of his investment methodology are repeated every year. But since repetition leads to solidification, that's not a bad thing. It's hard to spot a bargain these days, especially with the markets so fairly-priced as they have been in the last year or two. So, it's no surprise the two names I'm currently interested in are highly controversial. However, I do believe they're worth a serious look. Here they are. Telefonica is a fixed and mobile phone operator based in Spain. Over 60% of its revenues though, come from outside of Spain. A huge chunk of it (43%) comes from Latin America and within Latin America, Brazil is its biggest market with a 43% share of the LatAm market. An attractive dividend yield of around 12%. Grown dividends at a compounded 23% annually for the last 7 years. Grown earnings at a compounded 12% annually for the last 10 years. A 10-year average earning P/E multiple of 12. A current P/E multiple of only 3.6. Sales (top-line) growth of 8% over the last 10 years. A book value that has see-sawed in the last 10 years and is pretty much unchanged. An average return on equity (ROE) of 25% with about 7x leverage. Assuming the stock will go no where for the next foreseeable future, but assuming earnings will continue to grow at least at an 8% annual clip and dividends follow suit with a 7% annual increase, the intrinsic price of the stock on a purely dividend-growth basis should be around $21, with a 15% annual rate of return. That is, the price at which an investor would receive a 15% annual return is $21. Currently, the stock is trading for $17, so it's a screaming buy assuming the company is not about to jump off a cliff. For the current price and same assumptions, one would be getting a 17% return on investment from its dividends alone. Any capital appreciation would be icing on the cake. AstraZeneca is the U.K. based pharmaceutical company that manufactures known drugs such as the popular cholesterol-lowering Crestor, among many others. It's been having some pipeline trouble recently and struggling to keep inventing new blockbuster drugs. It has gone through a $2.4 billion restructuring that has so far cost $2.5 billion to implement. It had 92 new drugs in its pipeline at the end of 2010, but 34 have been dropped so far. With an aging global population, the growth story is that health care will continue to be a big part of people's expenditures. To counter, competition from generic drug makers is heating up, with some generic manufacturers speculatively launching clones even before the original's patent expiration happens, on a gamble to challenge the patents in court. Blackrock, the big investment outfit, just recently bought 6.45% of the company. A high yield, 6.5% dividend. Grown dividends at a compounded 16% per year for the last 10 years. Grown earnings at a compounded 12% per year for the last 10 years. A 10-year average-earning P/E multiple of 13. A current P/E multiple of only 6. Sales (top-line) growth of about 8% annually for the last 10 years. Book value that has grown at a 12% annual rate for the last 9 years. An average return on equity (ROE) of 34% with about 2.2x leverage. Assuming the stock will go no where for the next foreseeable future, but assuming earnings will continue to grow at least at an 8% annual clip and dividends follow suit with a 7% annual increase, the intrinsic price of the stock on a purely dividend-growth basis should be around $35, with a 15% annual rate of return. That is, the price at which an investor would receive a 15% annual return is $35. Currently, the stock is trading for $45, so it's a bit pricey for the conservative assumptions above. For the current price of $45 and same assumptions above, one would be getting a 13% return on investment from its dividends alone. Again, any capital appreciation is pure extra goodness. Both stocks are trading close to their 52-week lows. With the current economic climate in Europe being negative, I wouldn't be surprised if they continue to slide in the near future. I will be sure to be buying more on pull backs. As Buffett always says, if the steak is cheap, buy more. As usual, do your own homework before investing. Disclaimers: I own TEF and AZN at the time of writing.